As Anna Bockman ’21 enters her second year of college, she has already engaged in critical research at Valparaiso University, playing a role in the possible development of future antifungal medications. The Plymouth, Indiana, native is one of 11 students at Valpo admitted in the fall 2017 cohort of the EPIC scholarship program, designed to provide funding and support for students who may otherwise be unable to pursue STEM education at Valpo in the College of Arts and Sciences. The program, made possible due to a grant from the National Science Foundation, is intended to increase retention among commuter and residential students through its many unique features, including financial assistance, one-on-one faculty mentorship, and cutting-edge research opportunities beginning in year one. EPIC scholarship recipients are invited to bond with others in the cohort of students who take retreats, share meals, and go on short outings that promote STEM-related topics and learning. They are also encouraged to participate in research projects at the University, with many having expressed interest in a project. According to Professor Michael Watters, Ph.D., professor of biology, who is a member of the faculty committee that pursued the grant, studies show that undergraduate students involved in research programs perform better in STEM-related classes, have increased retention rates, and experience greater success in other classes. While the program is intended to improve the retention of commuter students, it is both commuter and residential students that have been accepted into the EPIC program. Ultimately, “the goal is to create a better connection between commuter students and the University,” Professor Watters says. A second cohort joins the EPIC program this fall, and both groups will take part in a fall retreat. In addition to a $5,300 annual renewable scholarship, the program pays students to take part in one summer of research. 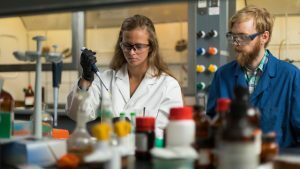 Anna is one of two students conducting research with Jeffrey Pruet, Ph.D., assistant professor of chemistry, who is studying the enzyme methionine synthase, an essential amino acid in all living things. Fungal methionine synthase, however, is different from the human version. He is looking at ways to engineer a molecule that could deactivate the fungal version, meaning the fungi could not make the amino acid, which in turn would keep the fungi from growing. This research is aimed at creating a basis for new antifungal medications. Professor Pruet hopes to build a molecule that can knock out the fungi from being able to make this essential amino acid without interference with the patient’s biochemistry. According to Professor Pruet, there are many types of fungal infections — some are a minor nuisance, but many can be life threatening. For HIV patients, cancer patients, or anyone whose immune system is compromised, a fungal infection can be life-threatening. This summer has afforded Anna and her fellow classmate the opportunity to engage in important research under a faculty mentor. Anna plans to continue to advance Professor Pruet’s research by extending her work in his lab this fall. During her time in Professor Pruet’s lab, Anna has been testing various building blocks that they hope to use to make antifungal drugs, looking to uncover ways to more easily modify each building block in order to rapidly generate and screen a multitude of diverse molecules. “The faster the molecules can be made, the faster we can test them, and hopefully find a lead compound to see what the next step would be,” Professor Pruet says. Anna arrived at Valpo equipped with a love for chemistry that she had developed in high school, but she describes her lab experience at Valpo this summer as being even better than she could’ve expected. It has been an invaluable experiential learning opportunity that will assist her in achievement of her long-term goal of working in a laboratory setting to develop pharmaceutical drugs. Valpo received just under $1 million from the NSF to launch the EPIC program, with a majority of that money paying for scholarships. Jon Schoer, Ph.D., associate professor of chemistry, who is also on the EPIC program committee, said scholarships provide more than money to the participants. “That we were able to provide sufficient support to students to either eliminate or reduce their need to work during the academic year helped a number of them to both perform better in the classroom and to have additional time for bonding with other students, especially those that are part of the program,” Professor Schoer says. The remainder of the NSF funding is used to pay students to do the research and for administrative fees, Professor Watters says. The program will award scholarships over three years to 33 students who must maintain certain academic standards overall and in science-related classes. EPIC program participants are encouraged to participate in research, with most being eager to do so. Also central to the program will be a study on whether the EPIC program improves the retention rate and performance of commuter students, Professor Watters says. With just one year of the program completed, it may be too early to draw any general conclusions about the program, but the retention rate among the first cohort is higher than the University’s average. Professors Watters and Schoer were joined by several other faculty members and administrators in developing the program. Also on the committee is Kristi Bugajski, Ph.D., assistant professor of biology; Karl Schmitt, Ph.D., assistant professor of mathematics and statistics; Mindy Capaldi, Ph.D., associate professor of mathematics and statistics; and Bonnie Dahlke-Goebbert, M.Ed., assistant dean of students for first-year students and commuter programs. Student-faculty collaboration and mentorship is an invaluable part of the Valpo experience, and increasing such opportunities is a priority of Forever Valpo: The Campaign for Our Future, a $250 million endowment campaign. Professor Pruet indicates that he enjoys his role as a mentor in the EPIC program and says he hopes to ignite an interest in science among all his students by being available to them outside the classroom. And that’s just what he’s done for Anna, who recognizes Valpo as the kind of university where students can develop a relationship with the professors. “Dr. Pruet is always there to help me,” she says. Professor Pruet exhibits appreciation for the enthusiasm that is always evident in Anna’s work. Professor Schoer said joining a group seemed to provide the students with an even tighter cohort with whom to interact and develop.